For smokers who are looking to kick the habit, the Great American Smokeout may be the time to take that first step. Tobacco use, including cigarettes, cigars, pipes and chewing tobacco, is the leading cause of preventable death in the world. In Louisiana alone, about 6,500 people a year die from smoking. If you’re still on the fence about quitting smoking – well, here’s some information that may help change your mind. The use of tobacco products extracts a high price from the health of Louisianans, of whom 28.9 percent of adults are users. The percentage of Louisiana high school smokers who use tobacco is startlingly similar at 28.5 percent. Overall, more men smoke than women in both groups. The lungs are obviously the organ most associated with damage from tobacco use. Smoking is the cause of an estimated 90 percent of all lung cancer deaths among men and 80 percent among women. Compared to nonsmokers, men who smoke are 23 times more likely to develop lung cancer and women are 13 times more likely. Additionally, about 90 percent of all deaths from chronic obstructive lung diseases such as emphysema, bronchitis and chronic obstructive pulmonary disease (COPD) are the result of smoking. Another organ that’s heavily affected by smoking is the heart. Smoking is a direct contributor to coronary heart disease, the No. 1 cause of death in the United States. In fact, one of every four deaths from coronary heart disease in America is caused by smoking. People who smoke are two to four times more likely to have coronary heart disease than nonsmokers. Your lungs and heart aren’t the only parts of the body to be affected by cancer as a result of smoking. Tobacco use is associated with a slate of cancers including acute myeloid leukemia, bladder cancer, cervical cancer, esophageal cancer, kidney cancer, cancer of the larynx (voice box), oral cancer (mouth), pancreatic cancer, cancer of the pharynx (throat) and stomach cancer. That’s not all. Smoking also increases the risk for stroke, Type 2 diabetes, tuberculosis, certain eye diseases (macular degeneration, cataracts, glaucoma, diabetic retinopathy and dry eye syndrome) and immune system problems including rheumatoid arthritis. It’s also a known cause of erectile dysfunction in men and contributes to infertility in both men and women. Remember, smoking doesn’t just affect the smoker. It affects everyone around them. Secondhand smoke – the combination of smoke from a burning cigarette and the smoke breathed out by smokers – can be nearly as dangerous as smoking itself. Infants and children exposed to secondhand smoke are at risk of severe asthma attacks, respiratory infections, ear infections and sudden infant death syndrome (SIDS). Teens are more likely to experience respiratory problems like asthma, shortness of breath, wheezing during and after exercise, and dry cough at night, as well as more likely to report missing school due to illness compared to teens who aren’t exposed to secondhand smoke. Adults who breathe in secondhand smoke can develop heart disease and lung cancer – nearly 34,000 premature deaths from heart disease every year in the United States are a result of secondhand smoke. There is no safe level of exposure to secondhand smoke. Let’s not forget about what smoking can do to the unborn. For the safety of unborn children as well as the mother, smoking is discouraged among pregnant women. It can lead to premature birth, low birth weight, birth defects like a cleft lip or cleft palate, and even stillbirth. Sadly, about 10 percent of American women have reported smoking during the last three months of pregnancy. Fifty-five percent of women who smoked three months before getting pregnant put down the cigarettes during pregnancy, but 40 percent of those same women began smoking again within six months of giving birth. Ready to kick your habit to the curb? 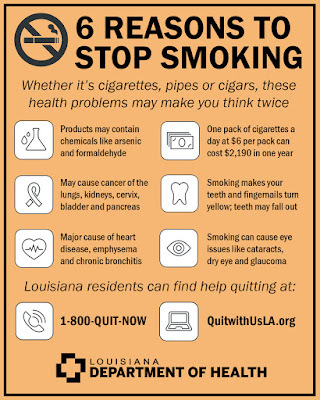 Through the Louisiana Department of Health, Well-Ahead Louisiana operates the Louisiana Tobacco Quitline (1-800-QUIT-NOW) through Quit With Us, Louisiana. The Louisiana Tobacco Quitline is staffed 24 hours a day and provides free, confidential support for people ages 13 and older in Louisiana who want to quit using tobacco products. It’s available in English, Spanish and a host of other languages. People who are hearing or speech impaired or deaf can find TYY and TDD assistance by calling 1-866-228-4327. 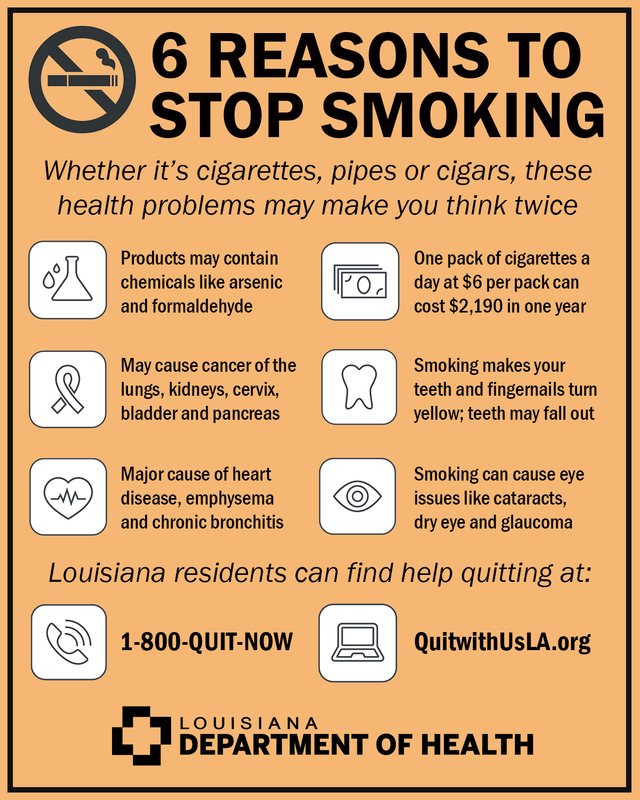 Quit With Us, Louisiana provides a variety of information and resources on tobacco facts, giving up tobacco products, personal stories from people who have given up smoking, medications and more. For more information, visit QuitWithUsLa.org.